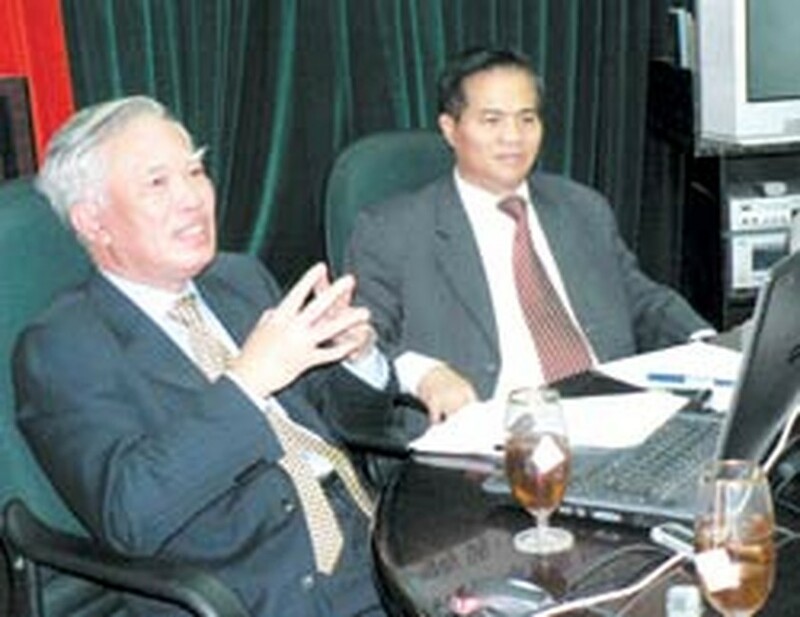 Former deputy PM Vu Khoan (L) at the online dialogue. Top priority is still given by the Vietnamese Government to agriculture and rural development, confirmed former deputy Prime Minister Vu Khoan, also the special envoy of the PM in his discussion with readers of the Communist Party of Viet Nam’s (CPV) online newspaper. Under the theme "Viet Nam’s Foreign Affairs- from WTO entry to success of APEC 14th", the online dialogue yesterday included Mr. Vu Khoan’s answers about Viet Nam’s changes and preparations when the country integrated into the international economy. Answering questions about the difficulties of Viet Nam’s agriculture in joining WTO, he confirmed that the Government still subsidizes the sector, especially irrigational works. Capital raised from government bonds will be primarily used to develop infrastructure facilities in transport (70%) and irrigational works (30%). Besides, Viet Nam also plans to invest roughly VND3 trillion in research of new agricultural varieties, in a bid to improve the current breed resources for domestic production. However, according to the former deputy PM, Viet Nam is now no longer be able to subsidize export of agricultural products, which also means that the government would shift its subsidies from export-import enterprises to the country's farmers. "Farmers should not be worried because the agricultural industry remains the country’s top priority and necessary measures to maintain the support will be carried out by the Ministry of Agriculture & Rural Development and other relevant units," he added. Regarding the future of Viet Nam’s financial-banking market, Mr. Khoan said it is this sector that causes the most concern for Viet Nam when joining the WTO because it has developed only in the last ten years. "Vietnamese commercial banks are allowed to sell shares to foreign enterprises but not more than 30% of the shares and foreign banks are allowed to open branches in Viet Nam but with a limited number and they must ask for permission if they wish to set up more branches. Similarly, there are regulations in securities markets and protection in financial sector," said Mr. Khoan, "This will help protect the local enterprises, especially commercial banks and financial companies who are gradually establishing their market positions." "However, we do not need to worry too much about competition with foreign enterprises since we will benefit from the participation of foreign enterprises in the financial market. It will help us increase the amount of capital and learn their modes of trading and through business doing with them, our financial enterprises will grow up," he concluded. Vietnamese Prime Minister Nguyen Tan Dung will join a similar online dialogue in January, 2007, which is, according to Mr. Khoan, an opportunity for people to discuss their trouble with Party and state leaders and for the leaders to understand people’s aspirations and to promote their policies. Minister of Education and Training Nguyen Thien Nhan will also have online discussion with people this month, announced Editor-in-chief of the CPV online newspaper Dao Duy Quat.